Imagine leaving the cares of the world behind and stepping out from your beautiful Vacation Home into the sunny skies and sandy beaches of Mission Beach, San Diego; with everything at your fingertips! This ideal Mission Beach House Vacation Rental is centrally located at the cross street of YORK - near all food, coffee, shopping & more. This area has new, up-and-coming cafes and restaurants to discover & experience throughout your stay. Offering 180-degree views of the majestic Ocean, this a ground floor unit sleeps up to 10 and will give you the perfect combination of comfort, luxury and enjoyment. Watch the dolphins swim by each morning and afternoon, enjoy the incredible sunsets from your comfortable, convertible Euro Loungers while watching your favorite TV show. Whether you want to sit & relax - watching people from all walks of life travel the boardwalk or invite friends to BBQ on the huge patio, this vacation rental is equipped for it all! Including bikes & parking (a commodity worth gold near the beaches). 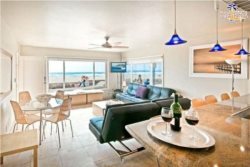 This beach house is loaded with features, including 3 swing arm mounted 4K TV's, under counter lighting, fully stocked kitchen (fully equipped to handle even a Thanksgiving dinner! ), built-in Washer & Dryer, and so much more! You will be in 7th heaven sleeping in one of the high-quality beds; Calvin Klein sheets, towels & pillows come from a 5 star luxury hotel supplier.